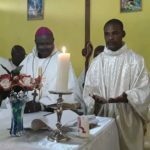 Here are some photos of the ministry of the Archbishop, The Most Reverend Dr. Jean Ndjewel, Archbishop of The Archdiocese of Mediator Dei, in Cameroon. The Most Reverend Joseph Iorhumba Pevigo from Nigeria has joined us with their clergy and the churches under them. WELCOME!